Late Watergrass (Echinochloa phyllopogon (=E. oryzicola)) is a monocot weed in the Poaceae family. In California this weed first evolved resistance to Group A/1 herbicides in 1998 and infests Rice. Group A/1 herbicides are known as ACCase inhibitors (Inhibition of acetyl CoA carboxylase (ACCase)). Research has shown that these particular biotypes are resistant to fenoxaprop-P-ethyl and they may be cross-resistant to other Group A/1 herbicides. Herbicide-resistant watergrass (Echinochloa phyllopogon (Stapf) Koss.) in rice in California. A.J. Fischer*, J.E. Hill, J.F. Williams, J. Anstey, K.M. Jahnes, and C. Ateh, University of California, Davis. Abstract: Accessions of watergrass were collected from selected sites throughout rice growing areas in California following reports of herbicide failure. Plants were grown in the greenhouse and treated with 0.17 kg ai/ha fenoxaprop, 4.5 kg/ha thiobencarb, 4.5 kg/ha propanil, 4.5 kg/ha molinate, and 37 g/ha V-10029 (Valent USA Corp.). Fifteen days after treatment the range of growth (fresh weight as percent of the untreated check) for each herbicide in surviving plants was: fenoxaprop 13-70%, thiobencarb 46-86%, propanil 10-21%, molinate 19-80%, and V-10029 13-63%. Several accession survived treatment (regrowth>20%)with more than one herbicide, including chemicals with different mechanisms of action. A dose-response experiment with one such accession showed the following R/S ratios : fenoxaprop 22, thiobencarb 10, molinate 2, V-10029 2, and propanil 2. Fourtimes the normal rate of fenoxaprop or thiobencarb failed to control this accession. Thus the repeated use of the few available grass hebicides in the predominantly monocultured rice of California may have selected for multiple resistance in late watergrass. Greenhouse trials comparing a known susceptible Late Watergrass biotype with this Late Watergrass biotype have been used to confirm resistance. For further information on the tests conducted please contact the local weed scientists that provided this information. There is no record of differences in fitness or competitiveness of these resistant biotypes when compared to that of normal susceptible biotypes. If you have any information pertaining to the fitness of Group A/1 resistant Late Watergrass from California please update the database. The Herbicide Resistance Action Committee, The Weed Science Society of America, and weed scientists in California have been instrumental in providing you this information. Particular thanks is given to Albert Fischer for providing detailed information. Boddy, L. G. ; Bradford, K. J. ; Fischer, A. J.. 2012. Population-based threshold models describe weed germination and emergence patterns across varying temperature, moisture and oxygen conditions. Journal of Applied Ecology 49 : 1225 - 1236. Opportunities for diversifying the management of weedy populations may be enhanced through accurate predictions of seedling emergence, because the timing and success of control measures often hinges on the timing of weed emergence. We used population-based threshold models to establish the temperature, moisture and oxygen conditions for optimum germination of herbicide-resistant and -susceptible Echinochloa phyllopogon, a weed of temperate paddy rice, and applied them to predict emergence from field soil. We combined hydrothermal time for germination, accounting for within-population variation in base water potentials (Ψb), with thermal time for early seedling growth to predict the quantity and proportional size of the emergence flushes that constitute final recruitment. Emergence in field soils was reduced by moisture stress and flooding, especially for the resistant population. In all populations, germination rates increased between 9.5 and 31°C, Ψb was <-1.0 MPa, and there was no sensitivity to oxygen supply. Synthesis and applications. Population-based threshold models produced physiologically meaningful germination parameters, which are useful in defining the environmental constraints to germination, and predicting Echinochloa phyllopogon germination and emergence in field soils. By exploring the effects of temperature, water stress and flooding on germination and emergence, we predict irrigation regimes for optimising recruitment and the timing of weed control..
Boddy, L. G. ; Streibig, J. C. ; Yamasue, Y. ; Fischer, A. J.. 2012. Biomass, fecundity, and interference ability of multiple herbicide-resistant and -susceptible late watergrass (Echinochloa phyllopogon). Weed Science 60 : 401 - 410. 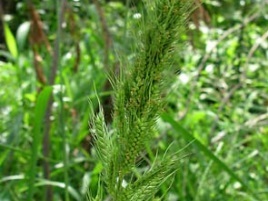 Echinochloa phyllopogon is a serious weed of California rice that has evolved resistance to most grass herbicides. We assessed differences in growth, interference, and fecundity between multiple resistant (R) and susceptible (S) E. phyllopogon. Interference with rice by R and S plants was similar, although R plants were shorter and had less leaf area and shoot biomass than S plants. Interference by one S or R E. phyllopogon plant with rice was 2.31 or 2.45 times greater than intraspecific interference by one rice plant, respectively. Interference was mostly driven by root interactions and E. phyllopogon on average produced seven times more root dry weight than rice. Deeper E. phyllopogon root placement compared with rice may explain niche differentiation between the two species. On average, R plants produced 55% less seeds than S plants. Lower fecundity could compromise fitness of R plants in the absence of herbicide selection, but partial avoidance of seed removal during rice harvest through earlier seed shattering may allow greater soil seed bank replenishment by R plants compared with S plants. E. phyllopogon control is needed to prevent high rice yield losses, and suppressing survivors of initial herbicide treatments is essential to limit seed bank replenishment by R plants. The potential benefits of taller rice varieties with enhanced root competitiveness, and that may be harvested earlier, should be considered..
Iwakami, S. ; Uchino, A. ; Watanabe, H. ; Yamasue, Y. ; Inamura, T.. 2012. Isolation and expression of genes for acetolactate synthase and acetyl-CoA carboxylase in Echinochloa phyllopogon, a polyploid weed species. Pest Management Science 68 : 1098 - 1106. BACKGROUND: Target-site resistance is the major cause of herbicide resistance to acetolactate synthase (ALS)- and acetyl-CoA carboxylase (ACCase)-inhibiting herbicides in arable weeds, whereas non-target-site resistance is rarely reported. In the Echinochloa phyllopogon biotypes resistant to these herbicides, target-site resistance has not been reported, and non-target-site resistance is assumed to be the basis for resistance. To explore why target-site resistance had not occurred, the target-site genes for these herbicides were isolated from E. phyllopogon, and their expression levels in a resistant biotype were determined. RESULTS: Two complete ALS genes and the carboxyltransferase domain of four ACCase genes were isolated. The expression levels of ALS and ACCase genes were higher in organs containing metabolically active meristems, except for ACC4, which was not expressed in any organ. The differential expression among examined organs was more prominent for ALS2 and ACC2 and less evident for ALS1, ACC1 and ACC3. CONCLUSION: E. phyllopogon has multiple copies of the ALS and ACCase genes, and different expression patterns were observed among the copies. The existence of three active ACCase genes and the difference in their relative expression levels could influence the occurrence of target-site resistance to ACCase inhibitors in E. phyllopogon..
Yasuor, H. ; Milan, M. ; Eckert, J. W. ; Fischer, A. J.. 2012. Quinclorac resistance: a concerted hormonal and enzymatic effort in Echinochloa phyllopogon. Pest Management Science 68 : 108 - 115. BACKGROUND: Quinclorac (3,7-dichloro-quinoline-carboxylic acid) is a selective herbicide widely used to control annual grasses and certain broadleaf weeds. Echinochloa phyllopogon (Stapf) Koss. is the most noxious grass weed in California rice fields and has evolved resistance to multiple herbicides with different modes of action. A quinclorac-resistant (R) E. phyllopogon biotype found in a Sacramento Valley rice field where quinclorac has never been applied was investigated. RESULTS: Resistant to susceptible (S) GR50 (herbicide rate for 50% growth reduction) ratios ranged from 6 to 17. The cytochrome P450 inhibitor malathion (200 mg L-1) caused R plants to become as quinclorac susceptible as S plants. Quinclorac rapidly (6 HAT) stimulated ethylene formation in S plants, but only marginally in R plants. Malathion pretreatment did not reduce ethylene formation by quinclorac-treated S and R plants. Activity of β-cyanoalanine synthase (β-CAS) in tissue extracts was 2-3-fold greater in R than in S plants, and incubation of shoot extracts with 1 mM malathion reduced β-CAS activity by 40% in both biotypes. CONCLUSION: Resistance to quinclorac in R E. phyllopogon involved at least two mechanisms: (a) insensitivity along the response pathway whereby quinclorac induces ethylene production; (b) enhanced β-CAS activity, which should enable greater HCN detoxification following quinclorac stimulation of ethylene biosynthesis. This unveils new resistance mechanisms for this multiple-resistant biotype widely spread throughout California rice fields..
Yasuor, H. ; Zou, W. ; Tolstikov, V. V. ; Tjeerdema, R. S. ; Fischer, A. J.. 2010. Differential oxidative metabolism and 5-ketoclomazone accumulation are involved in Echinochloa phyllopogon resistance to clomazone. Plant Physiology 153 : 319 - 326. Echinochloa phyllopogon (late watergrass) is a major weed of California rice (Oryza sativa) that has evolved cytochrome P450-mediated metabolic resistance to different herbicides with multiple modes of action. E. phyllopogon populations from Sacramento Valley rice fields have also recently shown resistance to the herbicide clomazone. Clomazone is a proherbicide that must be metabolized to 5-ketoclomazone, which is the active compound that inhibits deoxyxylulose 5-phosphate synthase, a key enzyme of the nonmevalonate isoprenoid pathway. This study evaluated the differential clomazone metabolism within strains of the same species to investigate whether enhanced oxidative metabolism also confers clomazone resistance in E. phyllopogon. Using reverse-phase liquid chromatography-tandem mass spectrometry techniques in the multireaction monitoring mode, we elucidated that oxidative biotransformations are involved as a mechanism of clomazone resistance in this species. E. phyllopogon plants hydroxylated mostly the isoxazolidinone ring of clomazone, and clomazone hydroxylation activity was greater in resistant than in susceptible plants. The major clomazone metabolites resulted from monohydroxylation and dihydroxylation of the isoxazolidinone ring. Resistant plants accumulated 6- to 12-fold more of the monohydroxylated metabolite than susceptible plants, while susceptible plants accumulated 2.5-fold more of the phytotoxic metabolite of clomazone, 5-ketoclomazone. Our results demonstrate that oxidative metabolism endows multiple-herbicide-resistant E. phyllopogon with cross-resistance to clomazone through enhanced herbicide degradation and lower accumulation of the toxic metabolite in resistant versus susceptible plants..